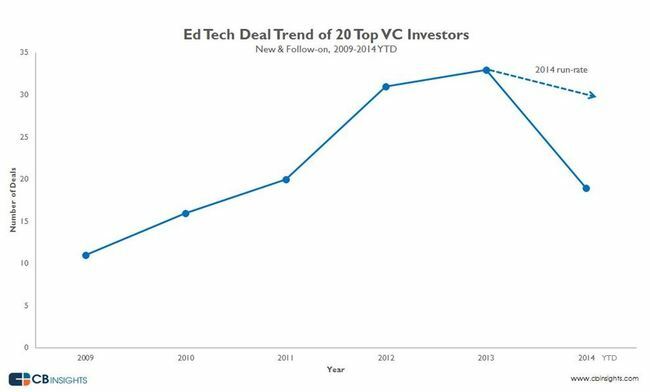 Overall investment in educational technology is still booming, but some of the most savvy venture capital firms are not making as many deals in that space in 2014 as they did in recent years, according to a new analysis. CB Insights, a New York City-based company that does market research and analysis, examined deal activity among “smart-money” VC firms—basically, those that have a strong record of making investments in companies that turn out to be hugely successful, and a record of benefiting from those deals. While “smart-money” VCs are continuing to put their money in ed tech, so far this year their focus has often been to “support existing deals versus [making] new deals,” CB Insights concluded. In fact, in its new analysis, the company identifies several areas of digital education where VC firms have continued to place heavy bets: software and tools focused on language study and acquisition; software and other tools that promote teacher-student collaboration; companies focused on data-analytics; efforts focused on coding and programming; and massive, open, online courses, better known as MOOCs, as well as similar online courses and tutorials. Pinning down the exact reasons for the decline in VC interest this year is difficult, because ed tech is such a diverse landscape, Sanwal explained in an e-mail. But he said that some venture capital firms don’t see great opportunities for making profitable exits from ed-tech investments, and so they may be choosing other areas. “That is a long, brutal sales cycle that we’ve heard many investors have lost the stomach for,” Sanwal explained. CB Insights looked at the ed-tech investment activity of 20 venture capital firms who met its “smart money” criteria and, according to the market researchers. Those comapnies have the potential to play a strong role in shaping the ed-tech movement, the authors say. For more details on CB Insights’ standards for choosing those VCs, see the post linked at the top of this entry. The 20 “smart money” VCs identified by CB Insights using its metrics are: Accel Partners, Andreessen Horowitz, Battery Ventures, Benchmark Capital, Bessemer Venture Partners, CRV, Greylock Partners, Kleiner Perkins Caufield & Byers, New Enterprise Associates, Redpoint Ventures, Sequoia Capital, Union Square Ventures, Spark Capital, Index Ventures, Khosla Ventures, Founders Fund, Google Ventures, Felicis Ventures, Floodgate Fund, and First Round Capital.